This drill focuses on defenssive zone coverage and backchecking. The drill starts with a 1 on 1 battle in front of the net ( F1 vs. D1). F1 is looking for a pass from D2 who has a puck behind the net. D2 makes as many passes as possible to F1 before the whistle blows. On the whistle, D2 caries a puck around the net and makes a breakout pass to F2. F2 and D1 then attack D3. F1 backchecks making it a 2 on 2 situation. Once the play is made, D3 becomes the player behind the net making passes to F2 in front of the net until the whistle blows. 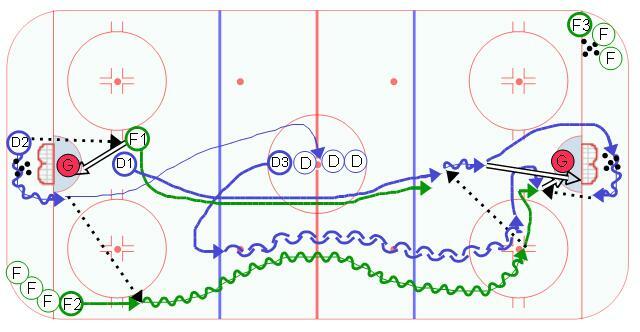 F2 then becomes the backchecking forward as D3 passes to F3. F3 and D3 then attack the other direction. The sequence continues back and forth.